Grace and peace to you from God our Father and our Lord and Savior Jesus Christ! Today for our meditations we have quite unusual event as described by Matthew. 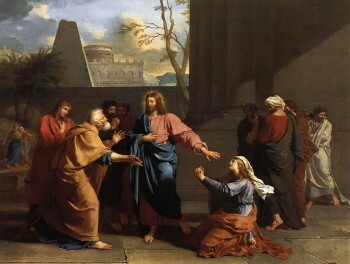 Jesus encounter with the Canaanite woman and their dialogue. It is unusual dialogue, confusing at the first sight. So we’ll look at this event and try to understand what was going on and what the Lord is telling us by including this event in His Gospel accounts. After His argument with Pharisees Jesus withdrew to the district of Tyre and Sidon. These were territories of Canaanites, historical enemies of Israel. They were one of nations which Israel was supposed to drive out the land, but never did. Thus their lifestyle and religious practices influenced Israel and led them to worship false gods and to embrace their fertility rites. But do you know what she was saying? What is this Lord? What did it mean to call someone the Lord? We don’t see it in our Bibles, for English translation hides it, but in the ancient Hebrew everywhere in the Old Testament, where we have the Lord, in original it is written Yahweh, the holy name of God that He Himself revealed to humanity. Yahweh, Yahweh, a God merciful and gracious, slow to anger, and abounding in steadfast love and faithfulness, keeping steadfast love for thousands, forgiving iniquity and transgression and sin… (Ex. 34:6-7) That’s what His name means. Israelites were afraid that they could accidentally misuse God’s holy name (2nd Commandment) so they chose not to use it at all, instead using ‘the Lord’. ‘The Lord’ and not God’s personal name Yahweh made its way into Greek translation of the Old Testament, and then into the New Testament. Therefore in many place in the New Testament, where we have ‘the Lord’, it refers to the same Yahweh who revealed Himself in mighty and merciful deeds as described in the Old Testament. Apostle Paul wrote in his letter to Corinthians: “No one can say “Jesus is Lord” except in the Holy Spirit.” (1Co 12:3) No one can say that Jesus is God Creator Yahweh, except in the Holy Spirit. Now this Canaanite woman addressed Jesus as the Lord. Also as the Son of David. Why the Son of David? Famous king David, who reigned 1000 years before Christ, still lived in memory of Israel as the symbol of righteous and just king. This was the promised king of Israel, the one who will triumph over all enemies. The one who will establish eternal kingdom of peace and justice. The Son of David. This had been the hope of Israel for almost thousand years. What is so unusual in this situation, that it was this Canaanite woman who addressed Jesus this way. O Lord, O Son of David! Did she really knew who Jesus was and confessed it in the Holy Spirit, or she just used this language to get Jesus attention and finally, what she wanted for her daughter? Which of these it was? Why did Jesus say this? For from the very beginning of His ministry, and Matthew emphasizes it a lot, Jesus was pretty clear that His ministry has universal importance. Wise men from East came and worshiped Him. Jesus was healing everyone who was brought to Him. In similar situation Jesus healed the servant of the Roman centurion, and praised his faith. Few verses earlier Matthew described Jesus feeding 5000 and in a few verses, in this same chapter He will describe Jesus again feeding 4000. Why did He say that He was sent only to the lost sheep of Israel? There is no explanation in the text. There are many suggestions. May be wanted to test the faith of the Canaanite woman. Did she really believed what she said or, just used religious language? May be He said with an irony, simply reflecting understanding of His disciples, or Jews in general? We have no answer to this question. We can only speculate why Jesus decided to talk with this woman so harshly. Matthew doesn’t give us any explanation. But He describes how the situation unfolded. The woman just wouldn’t stop. She didn’t take ‘no’ for an answer. The faith of this woman keeps surprising. First, she addressed Jesus as if she truly knew who He was. The Lord Yahweh Himself coming to establish His eternal kingdom. Now she confirmed her understanding with these words. She acknowledged that Jesus as the Son of David is indeed the promised king of Israel, but her answer implies that she also understood that His reign has universal significance. For all nations, even for Canaanites. Her answer illustrates how well she has understood the riches of God’s mercy. When God lavishes His grace over us there is enough for everyone. It is not just for some. No, Jesus just feed 5000, and the disciples gathered 12 baskets from leftovers. There is no shortage with this God. Then Jesus answered her, “O woman, great is your faith! Be it done for you as you desire.” And her daughter was healed instantly.” This is how Jesus Himself characterized the woman’s faith. Great is your faith. Great is your faith! So what does the Lord teach us through this event? At least two things. Something about faith and about proper attitude approaching our God. What did Jesus mean by ‘great is your faith?’ This is important for us. As Christians we would like to have a great faith. Did He praised her persistence? As if our faith could be characterized by how many times we keep asking for something. It wasn’t about her persistence, but about her understanding given by the Holy Spirit. The Canaanite woman understood who Jesus was. What did she saw before here? She saw this Jewish man, but she believed that He was God Yahweh, the Son of David, the promised Savior, who comes to pour out His love and mercy over all people. She understood who Jesus was, and she also understood that only in Jesus she has access to merciful God. She understood that there is no other place you can access God’s mercy but in Jesus. He is here for us: merciful and gracious, slow to anger, abounding in steadfast love and faithfulness, forgiving… That’s what made this woman’s faith great. We often face situations in our lives, where circumstances are less than favorable for us. When we look at them, we may conclude that God is on vacations. That He has forgotten His responsibilities. Or, if He has not forgotten then it is even worse. Then He is the one who has permitted all these evil things to happen. Sickness. Loss. Problems in relationships, Unfaithfulness. Arguments. Where to go, where to run? You can’t run from God. Right? What to do if He is in charge and you can’t understand why He permits all this evil to happen? You run to God, who is gracious and merciful. Who has assured that He will be with you always, till the end of the age. Who has given His life so that you can live. You run to Jesus Christ, our Lord. He is merciful God, God of grace and compassion. Whose abounding love is enough for everyone. This is what makes our faith great. When we know who Jesus is and when we seek Him in all our needs. Last thing. How to approach our God. It is interesting to see disciples reaction in this event. Sure, they were Jesus disciples. Sure they had been together with Him for a long time. They were, so to speak, insiders. When the Canaanite woman came, they even thought that they can command Jesus what to do. Send her away. Give her what she wants and then… send her away. How often do we consider that we are insiders with God? That we belong to His circle, that we can almost tell Him what to do. We and them… these others. For we are together with Him, right? He is one of us. He is our friend. No, He is God, and we are not. We tend to forget something this Canaanite woman reminds us so well. O Lord, have mercy of me! She knew she didn’t deserve Jesus help. Neither do we. Jesus didn’t owe her anything. As He doesn’t to us. She didn’t say, O Lord, as a non-citizen I’m still entitled to receive medical care for my daughter, I know my rights, give me what belongs to me! No… Lord, have mercy! This woman reminded us what our attitude to God has to be. God doesn’t owe us anything. We owe Him everything. All that we receive from Him, we receive only thanks to His mercy and love towards us. He not only daily provides for our needs, He has laid down His life to reconcile us with Himself. To grant us forgiveness. And He has prepared for us something that human eye hasn’t seen. Something that our words can’t express.